The intention of the week ultimately was directed towards having a harmonious state of mind. Personally (Jordan here), this week while visiting San Diego I had a breakthrough around midnight. A seemingly minor situation flared into an enormous fear in my mind, then suddenly I saw her, I saw that old person I was. I became new in 1 second; the moment I saw what I was doing to myself going to these worst case scenarios in my mind. And when I realized that the worst case scenario thinking was producing a peptide, I realized that was the last time. So I crossed to the other side of fear in 1 second with ease, and it was then when I could not only see myself differently but also the partnership between myself and Larry. This possibility was always there, I just hadn’t seen it so clearly until I cleared out a block within myself and then the truth manifested in the moment. When I intended harmony in my meditations this week coupled with the new understanding that we humans are comprised of electrons (a negative particle) and it’s our mind that impresses upon us what we ‘are’ and ‘are to be’ (positive action), my mind opened. If we remain as we ‘are’ only steering our ship in circles we do not travel to a desired destination. However, if we change our state of mind and intend a way of be-ing, we then see new possibilities because we’re not guided towards the old peptides. WE ARE DESIRING A NEW WAY OF BE-ING and FEELING. See, all the mumbo jumbo about The Law of Attraction is good and all but it’s missing something key; consciousnesses. Just simply imagining what we want as an ‘image’ isn’t enough, we actually have to work with our biology to feel/vibrate a certain way to walk into that moment where we’ve become the correctly vibrating vessel to harmonize with our desire. The point is, is if we continue to entertain the same thought patterns our biology responds in kind, so to get a different result we must think differently. How is that done? Well that’s what this process is all about, change. However, the difference between this week and all others is that now is when the work of the heart comes into play. To be a good person with good intentions, we have to be within a good, true, whole and light heart. This is a spiritual work. If we want to have different results in our life we have to root out the pain or resentment that causes negative thoughts. Negative thoughts bring forth negative biology which attracts negative states. Forgiveness and acceptance are the fertilizer to help bring forth a harmonious state. Because, now we’ve taken the focus off of our ego and into our spirit and heart. Instead of just seeing what is wanted in our mind, how about moving the locus of control to what we want to feel? Wow! If we want harmony and ‘are’ harmonious, there are certain thoughts that just won’t resonate with us any longer, namely, thoughts associated with worst case scenarios are rapidly booted out of the oscillation – because when looking from a state of harmony not chaos, it is then that harmonious possibilities are conceived. By the end of the week Larry and I aligned in such a way that our goals are manifesting through each other and there is a space between us that operates from a vantage point of reverence. 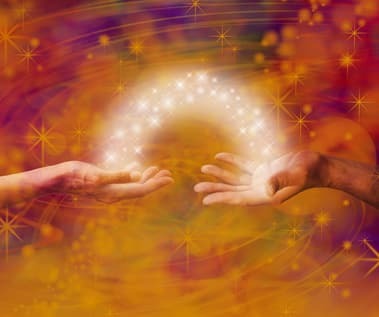 We’re both spiritual creatures with a true respect for the divine, that’s always been there, but today we’re trusting the space more, we’re in faith knowing there’s an energy working for us as a team. We’re 2 hearts in the same ship, agreeing on the destination. That’s awesome keep growing and going:)! I needed to hear this tonight! thanks for being such an amazing writer!